Remember the age old puzzle, What came first, the chicken or the egg? Well a few scientists took it up seriously and now seem to have an answer to that puzzle. Scientists from Britain have come up with a way to crack the riddle using computer simulation. The Scientists think that the chicken was the one to come in first before the egg. Scientists and researchers at the Universities of Sheffield and Warwick say that the secret of the puzzle lies in the eggshell. 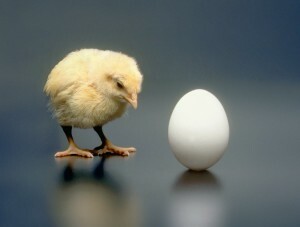 They suspect a chicken protein and its vital role that it plays in forming the egg shell. The protien called vocledidin-17 (OC-17) plays a part in eggshell formation. Using the new technology the scientists were able to demonstrate exactly how the protein makes it all happen! A comupter simulated how the protein acts as a catalyst to kickstart the formation of crystals that make up an eggshell. The OC-17 protein then drops off when the crystal nucleus are large enough to grow on their own. This also ends up freeing up the protein to start the process again. Well now when your kid comes running to you to ask you about the puzzle, you can smile at him/her and say computers have the answer! Next First cross-platform Android-iPhone game launched! Didn’t dinosaurs lay eggs, so therefore the actual egg came first, now if your talking about what came first, the chicken or the chicken egg thats different, so i think eggs were laid b4 the chicken was anywhere to b seen!! well Luc, i think the chicken evolved and then laid an egg.. because think about it its easy for something to form or evolve and then lay the egg rather than the egg forming and then chicken coming out..